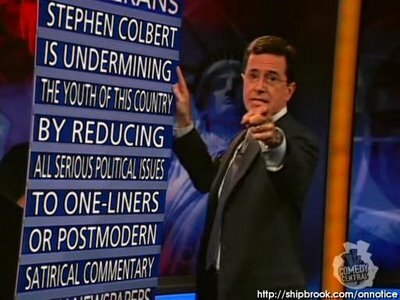 I will admit that I have felt the fascination of Colbert. But I have also felt the allure of Jon Stewart. I would compare Colbert to Mezentius, despicator deorum, were I not afraid a Virgilian allusion would be lost on an age that prefers its epics long and Greekish. 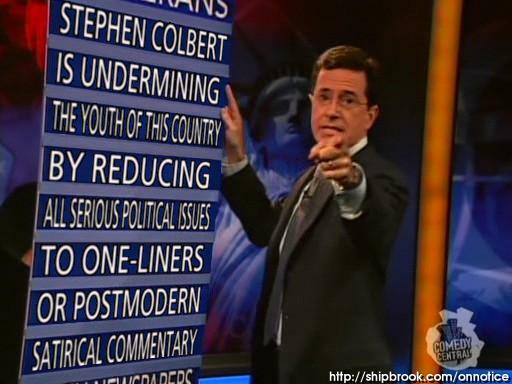 Undermining the youth = corrupting the youth = Socrates = Colbert is Socrates. ahhh, at last even our friend Colbert has made it into Hansoniana. Methinks many of my august colleagues will rejoice much at this occurence. I think the thing to remember about beloved C-Bear is that his function is not to provide an unbiased, accurate commentary on politics to the youth- his character is a mockery of the un-biased talking heads, leading to his general un-biased-ness. Admittedly, his political agenda is right out there, as is Jon Stewart's, but I really feel that they are similar to how Kelly painted them- gadflies poking and prodding at the establishment. I think they are fulfilling what they wanted to if their audience is thinking. P.S.- GAH ACHILLES!COLBERT RAWR FANRAVE That t'would be a sensory overload indeed, dear Jessica. Mockery. Not Socratic critique. Socrates did not make money doing what he did. Mockery. It is negative. Have you ever witnessed Jon Stewart put forward a real political proposal or philosophical claim? I did once. It was a little pitiful. 'Tis all too easy to mock, much more difficult to build that which exposes one to mockers' ready wit. Hmm. Point taken. I suppose, in my view, mockery does not always have a negative connotation. Or maybe, when I used mockery, I didn't mean it in that sense. I think that political satire can be both amusing and insightful, and I do think some of the issues identified by the two shows should be raised by somebody. In history, I really think that satirical performers whose satire rings of truth have helped shape the course of peoples' views on their leaders, demanding they live up to the responsibility they accepted with their authority. Perhaps, the main thing to remember with them is that they are intended for entertainment. While I definately understand frustration at people who tear down but offer no suggestions to build up, I really think they have no responsibility to that. They're there, at their base, to make us laugh. That is their purpose. I'm not sure it's a comedian's role to offer political solutions to some of the most difficult problems America has ever faced. I do think, however, that a comedian may point out the mistakes an administration makes, if that's the material he works with. Jerry Seinfeld has never been required to suggest a preferable alternative to the dreaded airline peanut, even though the youths' view of this tasty legume have been forever changed.